Today is Monday, November 30, the last day of November and the Feast of Saint Andrew the Apostle. 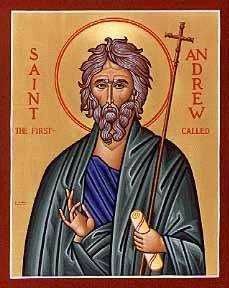 Andrew was a disciple of John the Baptist before he was called to follow Christ. He was also Peter’s brother. Here’s what Saint John Chrystostom has to say about Andrew in today’s Office of Readings. Chrysostom goes on to point out that this conversion didn’t happen over night. It was a process then and it’s a process now. Even some of the Apostles, the men who lived with Jesus during His earthly ministry didn’t “get it” until after the Lord’s death and resurrection. For one of them, Thomas, it took even more. Here in the early days of Advent would be a good time to examine our own conversion process and to ask ourselves if we’re following Andrew’s example of sharing the good news with others. Here’s some news from the Catholic News Agency. The U.S. Bishops have launched a new web site for the Advent and Christmas seasons. It features a virtual Advent Calendar. Clicking on a day of the calendar takes you to a page of prayers and activities for that particular day. Pretty neat! The site also features other prayers and blessings for the season, facts about Advent and Christmas, and a resource page. Check it out!